Understanding the risks assumed in your financial life is an all-important exercise. The best crafted plan can be bamboozled by the chance auto accident, house guest injury, or the unforeseen Long Term Disability event. 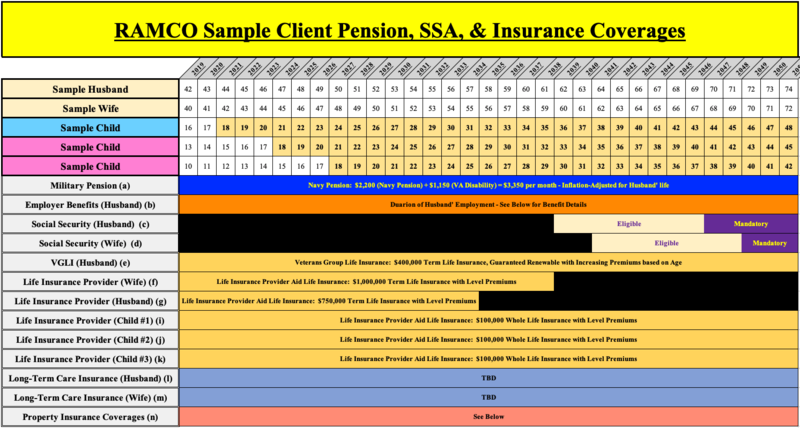 While there are many tools available, I have found using a simple diagram to illustrate Client insurance coverages to be an invaluable resource. The typical individual assesses risk management mostly through inertia - I have had car insurance for forever, I need to have car insurance, I am going to renew my auto insurance policy. In some cases, like auto insurance, this methodology is sufficient. In other situations - particularly when the same individual is in unfamiliar territory - this same methodology can be disastrous. A prime example is leaving a job where Long Term Disability coverage is provided to start your own business, thus foregoing Long Term Disability coverage. While listing out and perhaps discussing the various insurance coverages may be of some assistance, mapping them out on a diagram is, in my view, a bit more exact while also providing a visual cue of areas requiring more attention. 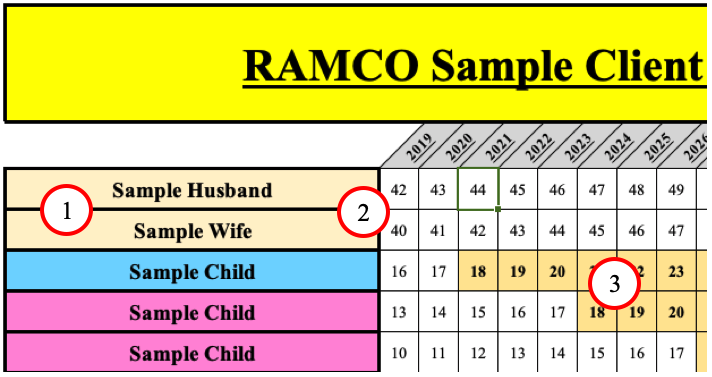 The various data points for each items are desired - coverage period, premium, beneficiary, etc. Pension and Social Security. Enter in the coverages and amounts, noting anything unique. Social Security. Note the ages when claiming is optional and then mandatory. Life Insurance. Make sure to note the end dates of Term Life Insurance Coverage. Recommended Coverages. For Insurance Coverages we recommend considering, we make an entry with 'TBD' indicating an insurance application may be forthcoming. Military Pension. 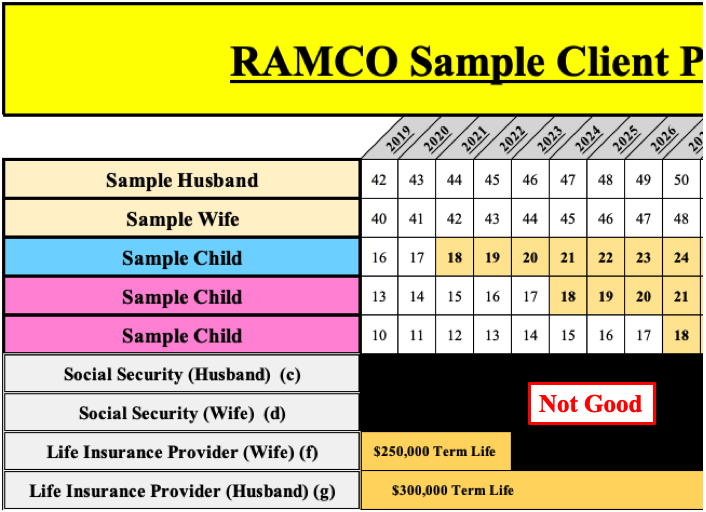 Enter the relevant data, noting if there is Survivor Benefit Plan coverage. Social Security. Input the early, on-time, and late claiming monthly payments. Employer Benefits. List each individually - these may be highly customized. Life Insurance Information. It is essential to know all the details related to each policy. How much insurance anyone or any couple may collectively need is indeed unique. Everyone's circumstances are different - Do you have a pension? How is your health? How reliant is your family on each respective income? The list goes on and on. We spend a good bit of time investigating this number. 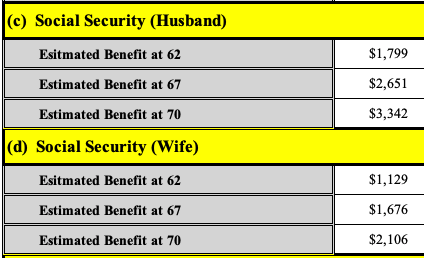 Neither the husband nor the wife are at Social Security claiming age. Life insurance coverage is only $250,000 on the wife's life. The wife's coverage terminates in 4 years. Life insurance coverage is only $300,000 on the husband's life. At least one child will be at home for the next 8 years. For these particular Clients, we would likely re-visit the amount of coverage needed, which likely exceeds the current coverage. Moreover, we would consider a longer duration of coverage since younger children generally mean lower net worth for the parents and more reliance on earned income. Thus, a greater amount of insurance coverage may be recommended. This amount of coverage may be valid, particularly if there is a need to fund something like a Buy/Sell Agreement for a business. However, we would definitely want to look a good bit closer at this amount of coverage and see if it is appropriate for the unique circumstances of the Client couple. Umbrella Insurance. Commonly referred to as Excess Liability Coverage, Umbrella Protection provides coverage for liabilities in excess of an existing policy, such as Homeowner's and/or Auto Coverage. With few exceptions, we generally recommend investigating Umbrella Insurance further, especially if teen-aged drivers are on the road. Long Term Disability Insurance. At all ages, the risk of becoming disabled exceeds the risk of dying. Therefore, it makes sense to give at least a cursory glance toward Disability Insurance. For some employees, this is an employer-provided benefit. For others, seeking coverage in the insurance market is the only option. Whatever the case, we document what the Client chooses regarding Disability Insurance. 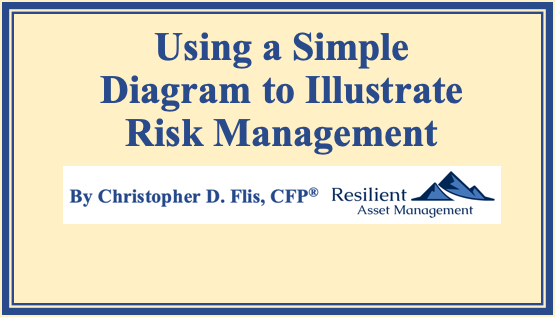 While not a panacea, the diagram explained above is an excellent tool for validating an overall risk posture. Of course, the various insurance policies are the governing documents; however, sometimes having a picture can assist with grasping the nuances involved with risk management. At the end of the day, we want to "lay off" catastrophic risk to an insurance company and mitigate those risks we assume to the maximum extent practical. Comments, criticism, and suggestions are always welcome. If you would like to provide any, please contact me here.